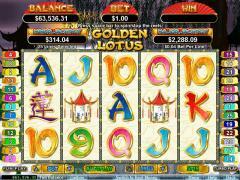 Golden Lotus is an Oriental themed online slot game from Realtime Gaming. The backgrounds depict various Oriental garden scenes and the general styling has an Oriental touch. The Golden Lotus is the wild symbol and the White Lotus is the scatter symbol. The other thematic symbols include the Golden Lotus Logo in Japanese calligraphy, Geisha, Statue, Chimes and Urn. All symbols show an eye for detail. The other symbols are the usual high value card symbols from Ace to Nine. Golden Lotus offers excellent jackpots of both the progressive and the fixed type. There are two independent progressive jackpots that can be randomly hit after any spin. The top two fixed jackpots both have a payout of 8888 coins. These are triggered by the Golden Lotus and the Golden Lotus Logo symbols. 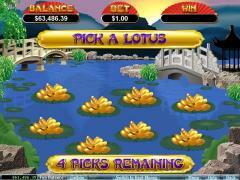 Golden Lotus is a 25 payline slot game. The number of paylines can be adjusted by manipulating the Lines button below the reels. The slot offers coin sizes ranging from 0.01 to 5.00. There are an adequate number of stops in this range to keep all kinds of players happy. However players are constrained to wager only one coin per payline. Golden Lotus offers two interesting bonus features. The first one is the Chinese Garden feature. It is triggered when 3 Golden Lotus symbols appear anywhere on the reels during the main game. In the second screen 8 golden lotuses are revealed. Players have to pick 4 of them. Each golden lotus picked awards the player either up to 100 times the triggering bet or a number of free spins. The free spins are randomly chosen from 5, 10, 15 and 20. During these free spins if any White Lotus symbol appears on the reels it is changed to either the Golden Lotus symbol or the Golden Lotus Logo symbol. All payouts are tripled during the free spins and this bonus game can be retriggered. The second bonus feature is the White Lotus feature. This feature is triggered when three or more White Lotus symbols appear anywhere on the reels. In this feature players are awarded 8 free spins. The highlight of the White Lotus feature is that a randomly generated multiplier is displayed on the top of the screen during each spin. All payouts during that spin are multiplied by the multiplier shown. The multiplier can be 3x, 4x or 5x. 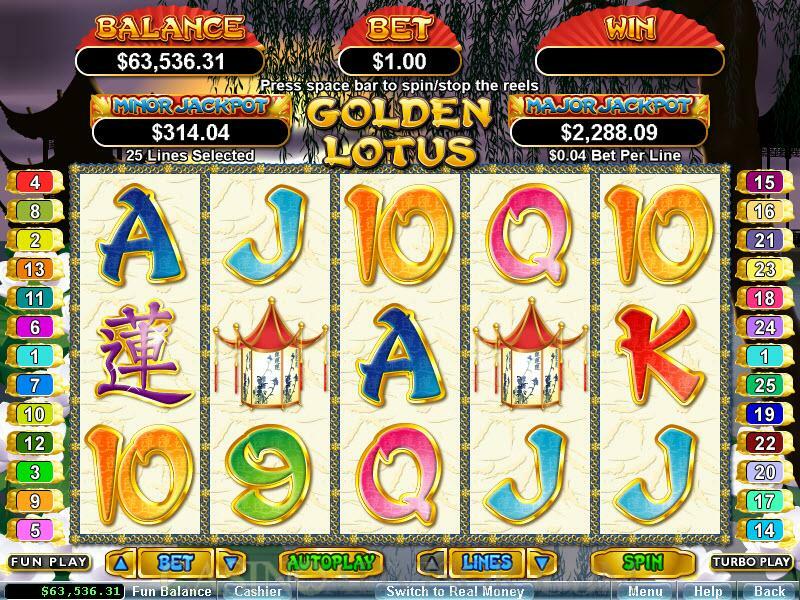 During these free spins if any White Lotus symbol appears on the reels it is changed to either the Golden Lotus symbol or the Golden Lotus Logo. If three or more Golden Lotus symbols appear anywhere on the reels during the free spins then the feature is retriggered. Interested in reading more detailed information about Golden Lotus? If so Click Here for more details.